Frost Lion 1st graders have been working hard building dams in Science to mimic the behavior of beavers. The Frost Elementary welcomed a film crew from WGBH this week. The PBS show, Arthur, visited the Frost to film a segment for a future episode to air this May. The episode will explore the concept of displacement. Many students shared their experiences with the film crew following the September 13th gas disaster. New Balance and Playworks got together to plan a fun volunteer day working with students at the Frost Elementary School. Frost students had a great time and say a big "Thank You" to our new friends at New Balance. Frost Elementary started their year out with a special guest! Mayor Rivera was there to wish them a great 2018-19 school year. The Frost Elementary held their first annual Kindness Celebration. Forty lucky students from each grade level were invited who consistently demonstrate the core value of We Are Kind! Congratulations to all students and a special shout out to the School Culture and Climate Team for putting this event together. 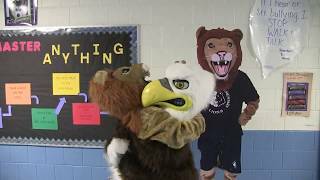 A behind the scenes look at what mascots do after school.